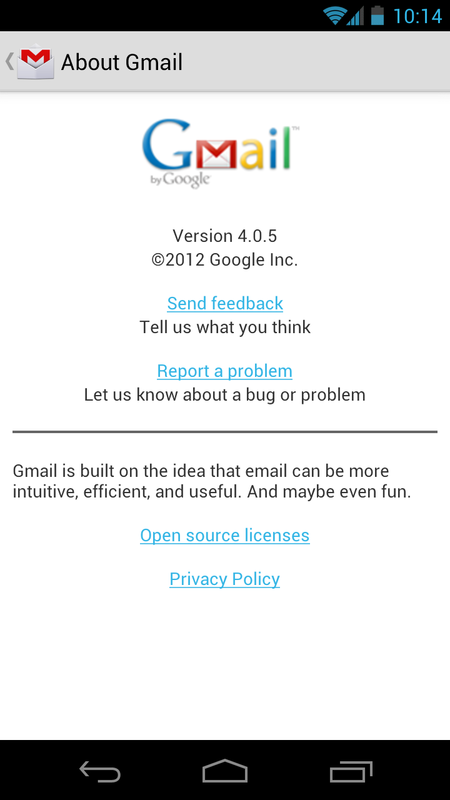 There is a Gmail update available in the Google Play store, but it is unclear what it changes. There is a changelog on its app page that lists “Security update,” however, the version number (2.3.5.2) doesn’t matchup to what I show on my Galaxy Nexus. I compared this new 4.0.5 to 4.0.4 and the differences are so subtle that you may not even be able to tell. Assuming that it’s nothing major and probably is a security update. Update: We were too quick in downloading and getting this post up that the updated changelog wasn’t available yet. It is now. Looks like Honeycomb tablets get the ICS experience and Gingerbread users should see better performance. Sync last 30 days of messages so you can read and search messages faster both online and offline. If you are struggling to download it to your phone, you are not alone. I was only able to update because I had other apps that needed to as well, so pressing the “Update all” button did the trick. Trying to update it through its app page does not seem to be working though.